The Phoenix Theatre is proud to announce our selection of four plays for the 2008/09 Season. It's an exciting one! From an edgy, award-winning new play by Theatre alumni to an age-old Greek classic, this season offers many diverse creative opportunities for our students to shine! Check out our new line up in Upcoming Events and enjoy the summer issue of BackstagePASS! for Favourite Play in Victoria! The Phoenix Theatre is proud to announce that their production of "Wind in the Willows" last November was voted Victoria's Favourite Overall Play for 2007 by Monday Magazine readers! Directed by Brian Richmond with gorgeous sets and costumes by Mary Kerr, the production was also a box office success, selling out during the run. Original music by John Mills-Cockell had audiences humming along. Kudos to all 31 cast members and to the many backstage crew that made each night a success! Associate Professor Warwick Dobson has been named the new Chair of the Department of Theatre. He suceeds Brian Richmond who held the position for the past seven years. Dobson, the University Scholar in Applied Theatre and Acting Chair for 2006-7, began his three-year term on July 1, 2008. We wish him well in the position. Also new on campus is Assistant Professor Conrad Alexandrowicz who will be teaching Movement classes. Welcome! In 2007, theatre professor Mary Kerr had the honour of designing the sets and costumes for Copper Thunderbird at the National Arts Centre in Ottawa. The play tells the story of acclaimed First Nations artist Norval Morrisseau. 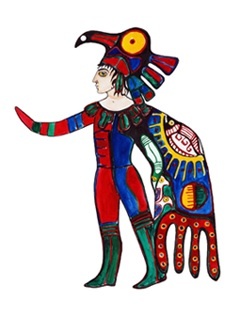 "Copper Thunderbird: Invention, Inspiration and Transformation," an exhibition at the University's Legacy Gallery (in downtown Victoria), features Mary Kerr's sets, costumes, drawings, and photographs of the play, along side of three decades of the artist's paintings from the Maltwood collection. The exhibition is on now until November 30, 2008. Last year's innaugural presentation of sign language interpretation for a performance of "Wind in the Willows" was so successful the Phoenix is expanding the program to two productions this year. Both "Legoland" and "La Ronde" will be presented on their Saturday matinees with interpretation for the Deaf and Hard of Hearing community. Sign language interpretaion will be performed by a dynamic team of Deaf and hearing interpreters, including Nigel Howard, an international Deaf interpreter, presenter, performer and teacher with over 14 years of experience working in theatre and performance interpretation across Canada. The interpretation of "Wind in the Willows" was a moving experience for all who saw it, whether a Deaf or hearing audience member, or one of the over 40 students acting or crewing backstage. We're proud to be able to bring the magic of theatre to the Deaf and Hard of Hearing community in Victoria. This program is offered with support from the UVic Equity and Human Rights Office and assistance from the Resource Centre for Students with a Disability. Subscriptions for the 2008/09 season are 20% higher than last year's record breaking numbers! Some evenings - like the night of our popular Friday Lecture series - are already full. At $11 per show, that's a whopping 50% savings off the individual ticket price! Plus, at the Phoenix, your subscription offers lots of benefits and flexible options to work around your busy life. Pick up our new season brochure or download our subscription order form for details. To subscribe, fill out the form and fax it to us or call Sandra Guerreiro at 250.721.8003. To order your Deluxe Member package, call Sandra Guerreiro at 250.721.8003. Wildly inventive and darkly funny, this coming-of-age tale chronicles the misadventures of two precocious teens on their odyssey from a hippie-commune to the big city world they call “Legoland.” Acclaimed at festivals across North America, this offbeat comedy is a contemporary vaudeville routine, complete with ukulele, puppets and gangster rap. Advisory: Not suitable for children. Sign language interpretion: Saturday October 18 at 2pm. Venture to the deep South for a dramatic love story set amongst the dark magic and rich music of the Appalachian Mountains. Based on the centuries old European folk song “The Ballad of Barbara Allen,” it tells the story of John, a witch boy, and his endeavours to become human after falling in love with a small-town Baptist girl under the dark of the moon. Follow the trail of love, passion and seduction through Vienna’s society in the 1890s. From a soldier and a prostitute, to an actress and a count, the intimate relationships of ten interconnected couples unfold like a witty, frolicking music round to comment on the sexual mores and class ideology of the day. Disturbing yet powerful, this Greek tragedy of betrayal and revenge chronicles the passionate story of Medea, a woman whose love ultimately leads to her destruction. Based on the myth of Jason and Medea, it was first produced in 431 BCE and continues to impact audiences today. Sessional instructor Fran Gebhard who directed "The School for Scandal" this past spring, is doing another time-bending approach to her direction of "Much Ado about Nothing" for the Victoria Shakespeare Society's outdoor production on Camosun College's Lansdowne campus. The play, which will be set as a western in the post Korean war era, includes many current and past Phoenix Theatre students including: Nathan Brown, David Christopher, Matt Coulson, Graham Roebuck, Brian Wrigley and Kholby Wardell and costumes designed by Kate Costin. Theatre alumna (BFA '97) Tamara Marie Kucheran won a 2008 Dora Mavor Moore Award for her Costume Design of the play "Intimate Apparel" at the Obsidian Theatre Company in Toronto. As well, Vancouver's theatre community recognized its best at the 26th Annual Jessie Richardson Theatre Awards. Professor Allan Stichbury won Outstanding Set Design (in a large theatre setting) for the Playhouse Theatre Company's production of "The Wars." Alumna Celine Stubel was also awarded the Jessie for Outstanding Performance of an Actress in a Leading Role for "My Chernobyl", which was also presented at The Belfry Theatre this spring. Did you know that one of our community partners - For Good Measure in Cadboro Bay Village - gives away tickets to the Phoenix Theatre regularly throughout our season? Sign up for their weekly newsletter at www.forgoodmeasure.ca for weekly specials chances to win! You'll also receive 10% off your first order! Thanks to Mark at For Good Measure for his amazing community support! The Phoenix Theatre would like to thank our individual donors and community sponsors for their support of our programs and our talented students! Thank you!